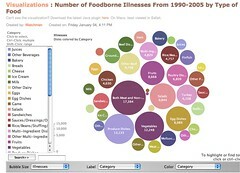 A few years ago, a little data visualization tool was put online. It leveraged the Social Security database of first names of children born in the US since the 1880s, piling up frequency in strata and placing a simple search tool atop the pile. The results remain fascinating. Just type in each letter of the alphabet and watch how trends in name first letters change. Turns out first names starting with the letter “I” are hot these days! Now, the people behind that have teamed up with IBM to create a new visualization site called “Many Eyes.” The goal is to generate a storehouse of socially networked data visualizations. It’s off to a great start, from what I can see. I was lucky enough to hear founder and CEO Martin Wattenberg speak at a recent event. He’s been very thoughtful and shown a lot of foresight in how the site is built. He said that his key insight when contemplating how to scale up a great data visualization site came when he thought, “Instead of scaling the data, you scale the audience!” The rest will take care of itself. In addition to easily uploading new data sets (text, spreadsheets, etc. ), users can share and comment visualizations, and the visualization is captured in the state it was in when shared or commented upon, so that users can see what the originator was seeing when sharing or commenting. Many Eyes is very easy to use, and the visualizations are a lot of fun, and often quite informative. Give it a shot — upload a document, some data points, some data you’ve found online, and process it there. See what it shows, and then share it so that your friends can give you other insights. Social data. A great idea! Kent Anderson is the CEO of RedLink and RedLink Network, a past-President of SSP, and the founder of the Scholarly Kitchen. He has worked as Publisher at AAAS/Science, CEO/Publisher of JBJS, Inc., a publishing executive at the Massachusetts Medical Society, Publishing Director of the New England Journal of Medicine, and Director of Medical Journals at the American Academy of Pediatrics. Opinions on social media or blogs are his own. 2 Thoughts on "Many Eyes = Many Brains"